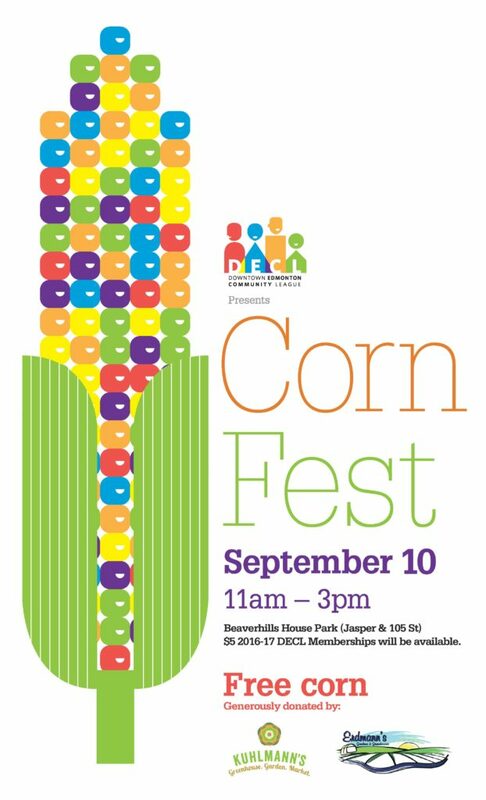 Join us at our Annual CornFest on Saturday, September 10, 11 am – 3 pm at Beaverhills House Park (Jasper Avenue & 105 Street)! Enjoy FREE Alberta corn-on-the-cob generously donated by City Market vendors Kuhlmann’s Greenhouse & Garden and Erdmann’s Gardens. Also join us for kids crafts, and music. Come on down and meet your downtown neighbours! Find our DECL booth and get your 2016-17 $5 membership! We will also be announcing the winners of our Balconies in Blooms Instagram photo contest! If you’d like to help out by volunteering, please contact us at programs@decl.org.